Their process, involved splashing, using gestural brushstrokes and dripping paint onto canvas rather than carefully applying it. 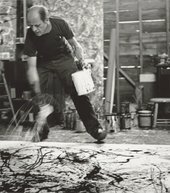 The term 'action painting' was coined by Harold Rosenberg in his groundbreaking article The American Action Painters published in ARTnews in December 1952. 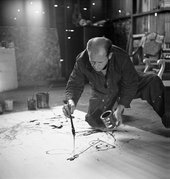 Rosenberg was referring to artists such as Arshile Gorky, Franz Kline, Willem de Kooning, and Jackson Pollock.